Books about eels are almost as mysterious as eels themselves - having gone an eon without a single word being written on the subject, we suddenly have an embarrassment of titles. From Medlar we had Steve Ricketts opus about catching them for sport and now, from Merlin Unwin’s Michael Brown, we can learn about catching them to live. Mike didn’t intend to become an eel catcher, instead he became one by degrees, but that is the way life goes when you are prepared to catch the pulse of it. A visit to the Somerset levels led to thirty years as a commercial eel fisherman, learning the job from scratch, from how to make nets down to how to transport eels by air. So this is the story of how to learn from experience - starting with one of his early elver shipments which cooked when the pilots of the aircraft transporting it turned on the heating and another one which froze when the pilots turned the heating off. Moving up to Sutherland to work the Laxford with his girlfriend Utta, they managed to set the cottage chimney on fire, which was a bad moment to discover that the nearest modern fire engine was in Inverness, but the day was saved by the appearance of the Duchess of Westminster’s personal fire engine. The following year the newly married couple had their first taste of the eel trade, which makes horse dealing look like an honest activity, eeling being the sort of business which has a magnetic attraction for extreme characters. 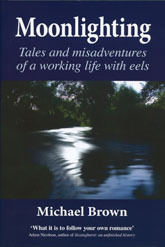 By the early eighties, the couple had a team of helpers and a couple of bumper harvests behind them, which is when the taxman struck... You get the picture - this isn’t really a book about eels at all, it is about life and to be quite honest, I haven’t read anything as good in a long while. If you enjoyed Gavin Maxwell’s Harpoon at a Venture, then you will enjoy this.